Picture someone who teaches meditation, and I am probably not that person. I am often dressed in a suit, for one, and my offices are in Midtown Manhattan. I am not at all New Agey. I am a natural skeptic, and I am even more obsessed with science than I am with baseball, which is to say, very. I am not into woo-woo stuff. My friends have a running joke about me: “How can a vegetarian be such a meat-and-potatoes guy?” I like things to be simple, practical, and thoroughly, unassailably logical. And for more than forty-five years, teaching the Transcendental Meditation technique has been my full-time job. The technique comes from the oldest continuous meditation tradition in the world. There is no philosophy, change in lifestyle, or religion involved in its practice. For well over five thousand years, the TM technique was passed down from teacher to student, one to one: never in groups, never from a book. It has roots in the ancient noble warrior classes, where acting out of fear or anger brought disaster and defeat. Today it is for all of us who seek greater balance in life as well as more creativity, better health, less stress—and happiness. Over those thousands of years, the TM technique has been honed to twenty minutes, twice a day: once in the morning, ideally before breakfast; and again in the late afternoon or early evening, ideally before dinner. You learn this meditation from a professionally trained teacher who will instruct you in a one-to-one session. He or she will give you your own mantra—a word or sound that has no meaning associated with it—and teach you how to think it properly, which means easily, effortlessly, and silently. You’ll learn that you don’t need to push out thoughts, or watch your breath, or monitor sensations in your body, or visualize anything. You’ll also learn that there is no need to sit in any particular position. You can sit up comfortably in a chair at home, at work, on a train or plane; on a park bench—basically, wherever it’s comfortable. The morning session wakes up your brain and gives you energy and resilience so that the demands and challenges of the day don’t stress you out. Then you meditate once again, ideally in the late afternoon or early evening before dinner, to start the next part of your day fresh. Twice a day, TM gives you a reset. I was in their shoes once, and I was perhaps more skeptical than any of them. In 1969 I was a university student with a nagging sense that there had to be something more I could be doing to be happier, healthier, more productive. I saw far too many people who had acquired the things that are supposed to make you that way, and yet they were often too stressed with too much worry, and, too often, unhappy. 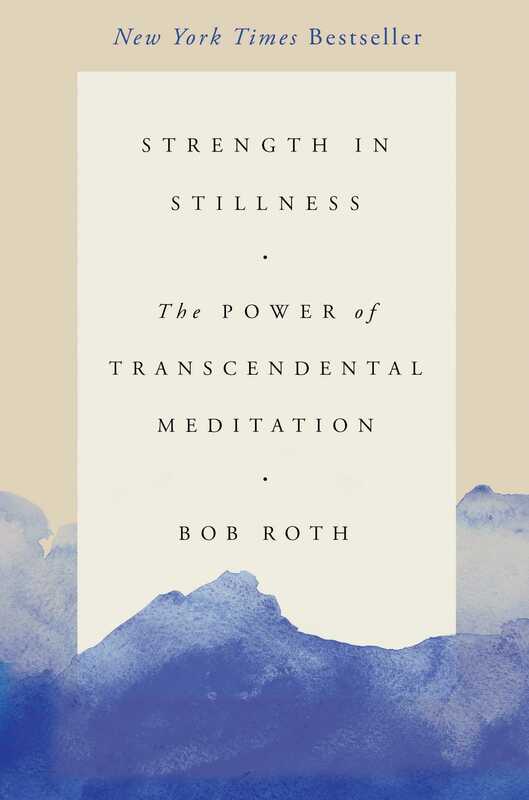 A friend whom I trusted, who had observed my own spiking stress levels from too much school pressure, suggested I might like Transcendental Meditation. I balked. I wasn’t interested. Meditation wasn’t even a word in my vocabulary. I was (and am) a very practical, down-to-earth, active kind of a guy. My trajectory was to go to law school so that I could run for public office and ultimately become a US senator. I wanted to help change the world. (Yes, we thought those things then.) Sitting around “meditating” didn’t fit into my life view. But I wasn’t sleeping well, and my memory was flagging, and I did respect my friend’s opinion, so I decided to at least give TM a try. Despite my initial reticence and skepticism, I found the experience to be marked, significant, real. It was astonishingly easy to do, deeply relaxing, and yet incredibly energizing, like nothing I had experienced before. From the very start, I knew that, somehow, I wanted to teach this to people; and, in particular, I wanted to teach it to inner-city school kids. A few years later, in January 1972, I took a semester off from my studies and enrolled in a graduate-level five-month TM teacher training course led by Maharishi Mahesh Yogi, himself a university-trained physicist and the foremost meditation teacher of this generation. During the course, Maharishi and a team of brain scientists, physicians, and psychologists explored ancient and modern insights into the science of consciousness, as well as the impact of stress and trauma on the brain and nervous system. We learned the unique mechanics of the TM practice and the role of this meditation for unfolding the seemingly limitless creativity and intelligence within the human mind, as well as its ability to address effectively many of society’s intractable ills. Most importantly, Maharishi taught us the simple yet precise technique of how to personally teach any individual to transcend—to effortlessly access the deep stillness that lies within every human being—in a way that was tailored specifically for that person. One, we are living in an epidemic of stress. We face more toxic stress now than at any other time in history. It compromises the immune system, stunts cognitive and emotional development, and raises blood pressure, the latter of which puts tens of millions of people at risk for cardiovascular disease—the number one killer of our age. Toxic stress also helps fuel a challenging range of disorders: eating, sleeping, learning, obsessive-compulsive, bipolar, and more. It speeds the aging process and shortens life spans. Day to day, stress fills us with so much tension and anxiety that it is often difficult to even enjoy the little things that used to make us happy. I travel a lot for my work, and I can see this stress in the faces of people I meet. No matter who they are, what they do, or where they come from, they tell me that too often they overreact to small irritants, much less life’s bigger challenges. They admit recoiling from a cell phone’s incessant ring, and they awaken to a jammed email inbox with dread. It’s not their imagination: stress, in fact, heightens our sensitivity to new stress triggers. In other words, stress begets more stress. Without any exaggeration—and to be brutally blunt about it—stress kills. And now we are in constant contact, living in a 24/7 plugged-in world that never, ever stops. We are glutted by information, demands, and sensory input. We are on an endless loop of requests to read, review, make a decision, keep, delete, reply, and move to the next request. The more success we achieve, the more high-stakes decisions we are forced to make. Yes, a lot of people are seriously overworked, and yes, a lot of people don’t like their jobs. But I also meet people all the time who love their work and relish pressure. They wish there were more hours in the day to get things done. People at the top of their game love to be challenged. But whether you love or hate your job, you can still pay the physical and emotional tolls of stress. You can enjoy your work but still struggle to do it effectively if it’s hard to get out of bed because you wake up feeling worn out or dragged down by a relentless undercurrent of anxiety. Or maybe you wake up superenergized, but that energy wanes in the early afternoon, and even those cups of coffee don’t give you the buzz you need to get through the day. Things that hadn’t bothered you before are starting to bother you now. You don’t remember things like you used to. It’s harder to concentrate for extended periods of time. For the first time, you find yourself getting tension headaches or relying on sleeping pills to make it through the night. Every single hand went up. Second graders! I was stunned. Stress doesn’t affect just those kids who deal with scarcity and violence and unstable home lives. Pediatricians are seeing more and more children from more affluent homes with adult levels of anxiety linked to performance pressure. So we know we have a problem, and we know we need a solution. The second reason for the surge of interest in meditation is that there is no magic pill to save us from the epidemic. That’s usually where we go for the answer: to the medicine cabinet. Sure, there is a zillion-dollar treasure chest of drugs to manage all those crippling stress-related ailments. We take Ambien to sleep, Xanax to calm nerves, and Adderall to enhance performance at work. Or we go “over the counter,” so to speak, to mask the symptoms by drinking multiple cups of coffee to make it through the day. Then maybe several glasses of wine to slow down for the evening. And kids, at earlier and earlier ages, are already reliant on antidepressant and antianxiety medications and drugs to control attention disorders. But, in truth, we get little from the pharmaceutical companies to actually prevent or cure toxic stress. The American Psychological Association concluded that its 2014 national study “portrays a picture of high stress and ineffective coping mechanisms that appear to be ingrained in our culture, perpetuating unhealthy lifestyles and behaviors for future generations.”4 The drugs from Big Pharma often prove ineffective—and those that do work can come with hazardous side effects. As the stakes get higher and higher, more and more people are naturally drawn to look elsewhere for a solution. Which brings us to the third reason for the explosion of interest in meditation: science, science, and more science. There is so much evidence validating the benefits of meditation that even the most skeptical among us has to (perhaps begrudgingly) acknowledge that something significant, something important, is going on when we meditate. But what does it mean to “meditate”? There is so much buzz about meditation and “mindfulness” in the popular culture, but there is also so much confusion. What is it, exactly? When I talk about meditation, I use an analogy. I tell my students, You are in a little boat in the middle of the Atlantic Ocean, and for as far as you can see, there is an expanse of blue. The whole ocean? Not really. Because if you could look at a cross section downward, you would see that only the surface is in turmoil. The Atlantic is several miles deep, and at its depth, the ocean is very, very calm. Down there is an unbounded expanse of peace and tranquility, entirely undisturbed by the turbulence above. The operative word there is inner. And the question is, is there such a thing as an inner? And if so, how do we get there? “How we get there” has been the domain of meditation since times immemorial. Meditation has long been associated with ideas of inner equanimity, clarity, focus, creativity, strength. But, again, there are so many different types of meditation. Are they all the same? Do they all work? But now that assumption no longer holds up. From brain science we know that there are basically three different approaches to meditation. This is because every discrete experience changes the brain in a discrete way: your brain responds differently if you listen to classical music or electronic music, if you watch a romantic comedy or a horror movie. In the same way, scientists have found marked, and important, differences in the way the brain functions during these different practices. Likewise, the cardiovascular, respiratory, and nervous systems each respond differently to each meditation technique. Understanding the three approaches is important because each requires different degrees of effort and difficulty to practice; each impacts the brain differently; and each produces different outcomes for the health of mind and body. Focused Attention includes the classic depiction of meditation in popular culture: someone sitting upright, cross-legged on a floor or pillow, eyes closed, and absorbed in a state of unwavering, deep inner peace. If you’ve ever gone to a yoga class, you’ve likely encountered this approach. Thoughts are seen as the disrupter of mental calm, so you are asked to minimize—or better yet, stop—your wandering “monkey” mind, to clear your mind of thoughts. How do Focused Attention techniques impact the brain? One way to tell is through electroencephalography (EEG), which measures the electrical activity of the brain. EEG readouts measured while test subjects practice Focused Attention show that these techniques enliven gamma brain waves in the left prefrontal cortex, the brain’s decision maker. This means that the electrical activity in the brain reaches a frequency per second of about 20 to 50 hertz (Hz), or cycles per second. You see a similar result when a student concentrates on a math problem—which makes sense, because gamma waves are found when one is engaged in a challenging task. In contrast to attempting to clear the mind of thoughts, the second category of meditation, Open Monitoring, is about learning to observe thoughts dispassionately, without judgment, as they come and go. This is because thoughts themselves are not seen as the potential disrupter of calm, but rather it is the content or meaning of thoughts that can disrupt. So you learn to have thoughts about annoyances at work or a reoccurring grievance with a partner while remaining calm, unaffected, and present. Back to the ocean analogy. Now you’re in that little boat, and instead of trying to stop the waves, you are observing them rise and fall without emotion. In the process, you’re generating theta brain waves, with the electrical patterns slowing to about 6 to 8 Hz, close to the onset of dreams. Theta waves are associated with creativity, daydreaming, and memory tasks. Several studies on mindfulness practices, many of which are included in the Opening Monitoring classification, also show alpha-2 brain waves (10 to 12 Hz) in the back of the brain. These waves are associated with turning off brain areas—in this case, the visual system—and beta waves (16 to 20 Hz), which means that you are actively engaged in directing your attention. In addition, neural imaging shows that such mindfulness practices activate the anterior cingulate cortices, which are involved in emotions, learning, and memory. Open Monitoring can help you become more present and centered during stressful experiences. It can help calm your amygdala—the area of the brain that governs emotions and emotional behavior—so that you don’t overreact to a situation. You can take a few minutes, breathe deeply, conduct a scan of how you are reacting, calm yourself, and reenter the fray. For many, it is a useful and practical coping tool. Open Monitoring is a cognitive process like Focused Attention. By definition, it keeps your attention in the present moment—on the level of attending to the surface thinking level of the mind. I have been fortunate to learn Focused Attention and Open Monitoring from some of the best instructors, so I know firsthand that there is value to both practices. But the one that I have practiced regularly for nearly fifty years—the one that I find the easiest to do and that delivers the most immediate and long-term benefits to mind and body—is the third type: Automatic Self-Transcending. Transcendental Meditation is in this category. Let’s return to the ocean analogy yet again: there are active, often turbulent waves on the surface, but there is calm at its depth. In the same way, we hypothesize that while the mind is active on the surface, deep within is a level that is calm yet alert; silent yet wide awake. The ancient meditation texts refer to it as the “source of thought” or “pure consciousness”—a field of limitless creativity, intelligence, and energy within. Scientists give it a more clinical description: a state of “restful alertness.” It is there. Deep within. Right now and at all times. Believe it or not. The problem is, we have lost access to it. The experience of restful alertness triggers a constellation of neurophysiological and biochemical changes in your body, including a reduction in high blood pressure; a decrease in galvanic skin response, which is an indicator of deep physiological calm; a 30 percent reduction in the stress hormone cortisol; and an increase of serotonin, which is the neurotransmitter, or brain chemical, associated with mood balance and happiness. Your body does this automatically as your brain functions in a more integrated, coherent style. And here’s the important thing: these effects are cumulative. The benefits of meditation last throughout the day, many hours after you’ve finished your twenty minutes. My friend and student Dr. Peter Attia sometimes prescribes TM to those who come to his offices in New York City and San Diego. Dr. Attia was a surgeon at Johns Hopkins Hospital, a surgical oncology fellow at the National Cancer Institute, and has been mentored by the foremost lipidologists, endocrinologists, gynecologists, sleep physiologists, and longevity scientists in North America. This ultrafit doctor is so consumed by his interest in human physiology that he wears a continuous glucose monitor 24/7 and a device to accurately measure his sleep quality through heart rate variability every night. He is his own case study in the pursuit of physiological excellence. His passion is his practice, Attia Medical, where his focus is the applied science of longevity and optimal performance. His clients are superstars in their fields; the kind of people working at peak performance. Now many are doing TM at his suggestion. Just about everyone I teach—the money manager navigating an unstable market, the parent holding two jobs to make ends meet, or the graduate school student feeling the pressure of an impending doctoral dissertation—says they want to continue to perform at higher and higher levels. At the same time, they don’t want to be stressed out, staying awake all night. Meditation, properly understood and practiced, addresses both of these concerns in one stroke by accessing the field of silence, creativity, and energy within. That is the strength in stillness. You will see that this book is composed of three pillars. In the first, I explain exactly what the TM technique is, how it works, what it does, and where it comes from. The second pillar will take you through what you can expect as you learn the practice, and there we will go deeper into medical and brain research showing exactly how TM heals your body, improves your reactions to stress, and optimizes brain function. The third pillar serves as an inspiration and guide as you start on this path to develop your full creative innermost self. In this final pillar you’ll meet people from all walks of life—CEOs, artists, veterans, and students—who have seen TM change their lives for the better. I will also share more of my own journey, and talk about what the TM technique has done for me. Throughout, I present Meditative Moments where you will hear directly from people about what it feels like to meditate, and more importantly, how it makes them feel throughout the rest of the day. Orin Snyder is not afraid of the word win. Considered one of the top trial lawyers in the world, Orin has represented Facebook and Bob Dylan, handled billion-dollar lawsuits, and earned his rep as an “attack dog” and the “deadliest lawyer in tech.” We met recently in his corner office at the law firm Gibson Dunn, high up in Manhattan’s MetLife Building, to talk about how TM has helped him become an even fiercer advocate for his clients. I’ve always been active and athletic, but two years ago, I started weight training around the same time I started meditating. I see them as close relatives. If you regularly lift weights for forty minutes a day, you will develop physical musculature. That investment of forty minutes completely transforms your body. The same is true for TM: if you meditate for twenty minutes twice a day, you will develop what I like to call the “chill muscle” that right now is inert in so many of us. I learned to meditate first and foremost so I could have more calm in my inner life. I wanted to worry less. Meditation delivered—and has been a game-changer in terms of my own personal happiness. But my regular meditation practice also produced unanticipated benefits in my professional life. TM makes me more effective as an advocate for my clients because it makes me less reactive and gives me enhanced clarity. Across all industries and professional endeavors, meditation can serve as a potent secret weapon. I call it the X factor in achieving transcendence in your professional life. Transcendence in the workplace translates into winning. Whether you’re a hedge fund trader, lawyer, or ballerina, TM helps get you to the next level in your professional pursuits by strengthening your focus and resolve. I often hear people say that TM is only for people who are interested in a serene interior life or a world of communal living in some post-utopian society free of conflict or competition. That is a myth. I’ll give you an example. I often have to fly to the West Coast for work. Last year alone I took fifteen or more trips. I usually have to execute a particular assignment on arrival, whether it’s a court hearing, board meeting, or client presentation. Oftentimes I’m exhausted, and I always have multiple demands on my time and on my mental focus. Recently I flew to California for an important meeting. I woke up at four in the morning for a six o’clock flight, and for seven hours on the plane I worked intensely to prepare a presentation. I arrived, the presentation went smoothly, and I turned around and got right back on a red-eye flight back to New York that same day. I was utterly exhausted, but instead of sleeping, I worked to prepare for another meeting the next morning. I was cramming without much sleep, and while I landed at JFK at dawn prepared substantively, I was spent. I went home to shower, shave, and put on a new suit. I got in a taxi uptown and headed to midtown for the meeting at my office. I could have fallen asleep right then and there, but it was obvious what I needed to do: meditate. I was drawn to it like a dog to a bone. Happily, traffic on Park Avenue cooperated, and we hit massive gridlock. Despite honking horns and cursing taxi drivers, I closed my eyes and meditated deeply for twenty minutes. I remember the moment of getting out of the taxi vividly, even physically. I flung open the door on Park Avenue, and when I walked onto the street, I felt alive and rejuvenated in a way that startled me. I had been practicing TM for enough time that I had developed a stockpile of calm that I accessed when I went inward for those twenty minutes. And the dividends were immediate: my body rewarded me with energy and clarity. That reservoir of musculature that I developed through all of my meditations was there to be activated. I nailed the meeting and was refreshed for that whole day. Critically, I did the second meditation that afternoon in an empty conference room. I needed more of a kick start, another dose of energy. I went home that night and went right to bed. But that taxi meditation was my source of energy, focus, and ultimately success. Now, I am not saying you have to keep my crazy schedule to benefit from TM. Transcendental Meditation is good for everyone.